Marty Stuart and His Fabulous Superlatives, Morgan Evans, Craig Campbell, Austin Burke and Josh Abbott Band Added To Country Thunder Arizona 2019 Lineup! | 2911 Enterprises, Inc.
FLORENCE, Ariz. – Today, Country Thunder Arizona announced the addition of a second wave of sizzling newcomers and a bona fide legend to grace the massive Country Thunder main stage in Florence, Ariz. April 11-14, 2019. Marty Stuart and His Fabulous Superlatives, Morgan Evans, Craig Campbell, Austin Burke and Josh Abbott Band complement previously-announced headliners Chris Stapleton, Tim McGraw, Dierks Bentley and Brett Eldredge. 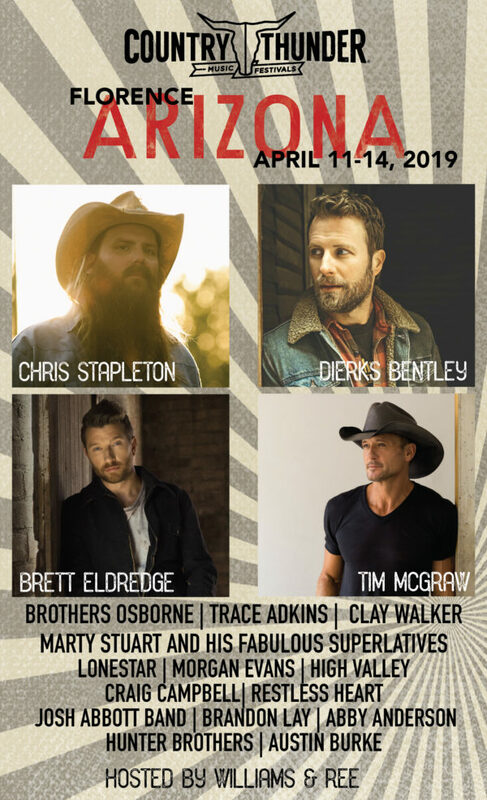 The weekend also includes award-winners Brothers Osborne, hot newcomers HIGH VALLEY, Hunter Brothers, Brandon Lay and Abby Anderson and country legends Trace Adkins, Clay Walker, Restless Heart and the original lineup of country supergroup, Lonestar! Aussie hitmaker Morgan Evans hit the Top-5 in America last year with “Kiss Somebody”, while Stuart recently celebrated his 50th year in show business. Flanked by his Fabulous Superlatives, Stuart will set the stage for Stapleton on Sunday night.